Stanley Yacht Services: Magical Mystic! As those of you who've been following our travels on Twitter know, we just spent five days up north in beautiful Mystic, CT and its surroundings, performing a yacht inspection [among our many services, we often do pre-purchase research - including physical inspections - for our clients, to help narrow their field of interest when they're in the market for a new vessel]. What can we say? Mystic is magical! 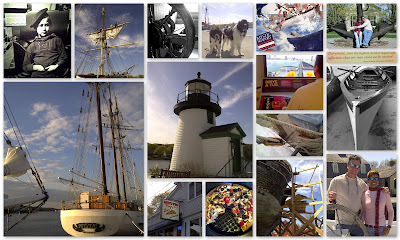 The weather cooperated [read: it wasn't too cold for us South Floridians] and we were able to mix in some pleasure with our business, exploring the famous Mystic Seaport and the Essex Spring Boat Show, eating lots of oysters and Mystic Pizza, and even randomly popping into a birthday party at Brewer Pilots Point Marina in Westbrook! We took so many pictures, we had a hard time even selecting a handful to share with you, but here are a few. Oh, and don't be alarmed by the picture of our Captain "at the helm" of a tug boat - he's decided to stick to yachts. You get the general idea; we had a great time. And special thanks to Captain John Hotte of Robert Christopher Yacht Sales for his wonderful hospitality in CT [including turning us on to "Russian Oysters"!]. We look forward to working together with you again in the future. Now it's back to all business here in South Florida! And we mean, all hands on deck! Between Triton's [always great] monthly networking event, more yacht inspections, repairing our buffer for compound waxing, and catching up on emails, it's been a busy, busy week. But, stayed tuned and we'll try to keep you posted!